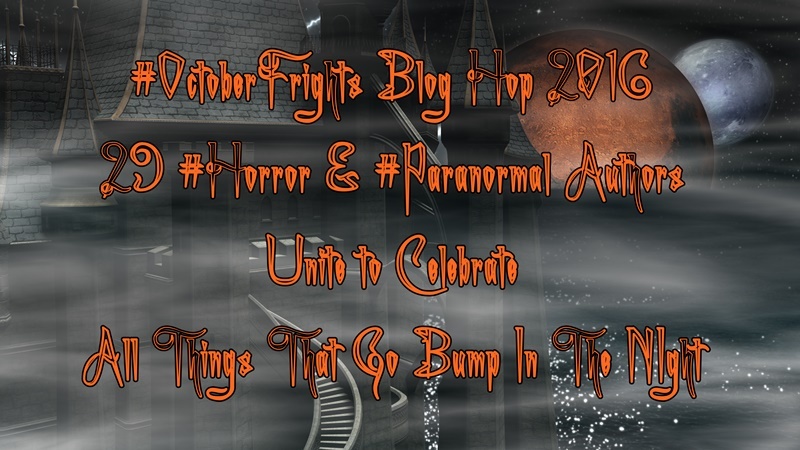 #OctoberFrights Blog Hop Day 4: What’s My Name? I opened my eyes and only saw red at first. ‘Whose blood is this?’ I thought. Damn I’m cold. My whole body is stiff. I cannot get up! ‘Why do they tingle?’ I wondered. I moved my head and saw someone else lying on top of me. I opened my mouth to say something to the figure, but all that came out was a gurgled sigh. What’s my name? The houses, they’re all boarded up, abandoned. ‘Why?’ I thought. I opened my mouth, as if to ask the world a question, but only a retorted a sigh, ending in an animal growl. I screamed inside my head. Something bumped into me from behind. A tall man in a suit stood next to me, the whole left side of his face burned away, burned down to black bone. I screamed, inside. A hiss came out of my mouth. Smell. Hunger. Some noise, very close, smell. Slowly, I flowed with the mass of the corpses towards the sound. I’m losing myself, so hungry, smell……..food. Hungry. Questions filled my head till I thought I’d burst. Kind of wish it had. What’s my… BOOM! Everything was moving. I was being pushed, carried away. In my head I was screaming. Out of my mouth, I’m groaning. I was under my own power as the mass had spread out. I wanted to be alone. Slowly, I made my way up to an open door. I felt like knocking, not that there would have been anyone to answer. Inside was quiet and dry. Empty. Walking toward a table, I sat in a chair, trying to collect my thoughts. I’m missing something. What is it? What did I forget? It was important, I was sure. What’s my name? A sound came from above me. Upstairs. A voice boomed in my head. My body moved to the stairs, I’m barely in control. Moving up the stairs, I heard noises, rising and falling. Hunger. Walking down the hallway, the floor creaked. A door suddenly slams shut. I throw my body against it, scratching, clawing, biting, and pushing. I moan. I grunt. So HUNGRY! Suddenly, the door flew open, and the world turned white. I woke up on the floor, my arms and legs missing. Hungry. Smell food. Hunger. A face appears in front of me. He’s crying. HUNGRY! ‘Shut Up! !’ I screamed inside. Again, I groan and moan. The man slowly puts something to my head. ‘What’s my name?’ I wonder. Suddenly the world went black. CLICK HERE to check out more awesome Brandon Henry stories, books, and poems. I love that you are able to create something complete, yet brief. A fabulous story, loved it.